It’s all about the attention to detail. And what is more important than the elements of your car that you see and touch every time you drive? Currently Golf 7 DSG only – but more models in development! Our new DSG Paddle Replacements are exquisite CNC-machined billet aluminium, beautiful to look at and cool to the touch. The +/- symbols are delicately cut out of the top of each blade. By extending the size of the paddles above and below the steering wheel spokes, it makes pulling that next gear easier in tight turns when your hands are busy with the steering. There are many cheap ‘stick-on’ paddles available. But as a full replacement unit, the RacingLine versions are completely different. 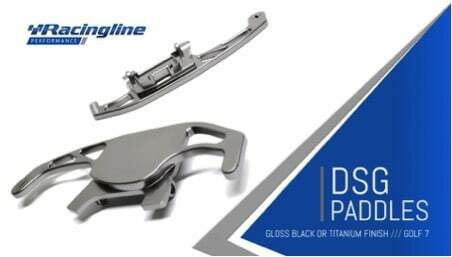 The stick-ons, as they rely on double-sided foam tape laid on top of the factory plastic paddles will never give the positivity or rigidity that you or your car deserve.